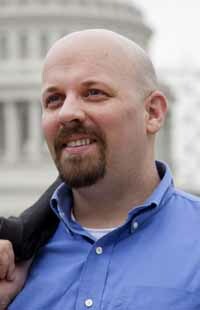 For Greenpeace Executive Director Phil Radford, it's going to be a somber Earth Day. Leaders of the international environmentalist group will gather in Washington, D.C., today to begin work on an initiative to promote clean energy nationwide, but Radford said no one feels much like celebrating this year. "It's more somber this year for us," he said. "There are so many human tragedies that have happened because of what we've done to our environment." This year, Earth Day follows the first anniversary of the Deepwater Horizon oil spill in the Gulf of Mexico and the more recent earthquake-triggered nuclear meltdown in Japan that spurred international concern over the risks of nuclear energy—hardly causes for celebration, Radford said. "People are still sick in the Gulf, dead animals are washing ashore and in Japan, they can't reclaim about 14,000 bodies because of radiation fears," he said. The poignancy of the events is perhaps worsened by Radford's argument that humanity has no one to blame but itself for the devastation. "These tragedies aren't an act of God," he said. "They're an act of greedy companies." Radford expounded on the greed of corporations, the dangers of energy consumption and how Blaine County can do its part during an interview with the Idaho Mountain Express in anticipation of his visit to the area in May for the Sun Valley Wellness Festival. Radford is a regular contributor to the Huffington Post and might be recognizable from his appearances on CNN, Fox News, NBC and ABC News. But he got his start on a much smaller scale, working to fight the construction of waste incinerators near his home on the West Side of Chicago. The waste incinerators were going up in a less-affluent neighborhood, and Radford said he started to realize just how stable and secure his life was compared with the less fortunate. "I was just kind of waking up to the fact that I was very lucky," he said. "I started looking and noticed injustices all around." Greenpeace, which has more almost 3 million members nationally, appealed to Radford because of its "completely principled" stance, he said. "A lot of people know Greenpeace for our tactics where we'll shut down a coal plant or stop people from drilling for oil," he said. Indeed, energy concerns are one of the organization's main focuses. Radford said America is far too dependent on fossil fuels such as oil. "We are running out of oil that's cheap," he said. "The places we get oil are generally places where we wouldn't want to support those governments." The only option is to attempt to find other locations, but Radford said those options, such as deepwater drilling, are expensive both financially and environmentally. "It's kind of like a nuclear disaster," he said of a proposal to drill for oil in the Arctic Ocean. "Even if [a problem] is unlikely to happen, the impact is so severe that it's not worth the risk." Coal is no better, according to Radford, who blames it for high mercury levels in fish and for the deaths of 13,000 Americans annually from pollution-related cancer. The problem is that coal and oil power everything from Facebook (whose corporate headquarters are powered via coal plants) to hamburgers and Coca-Cola. "If you eat a hamburger, there's actually a huge amount of oil that went into that hamburger," Radford said. "The process is incredibly energy-intensive." Oil goes into trucking water to crops that feed the cows, which are in turn slaughtered and trucked long distances in refrigerated trucks. Coca-Cola is an even more egregious oil-consumer, Radford said. Oil goes into mining aluminum ore, then shipping it to Iceland for refining and two other countries before a soda can is completed. "It takes a year and a lot of oil and it's a real waste in every way," Radford said. That doesn't mean that Coke drinkers should feel guilty about their choices. Radford said the onus is on corporations to make more energy-conscious decisions. "You should be able to have a Coke without feeling bad about it," he said. "Coke should be using 100 percent clean energy. We need companies to give us that option." But with large corporations and oil company lobbyists pressuring governments to look the other way when it comes to intense energy consumption, can the average person make a difference? "Young people of all classes and all races are even more strongly environmentalist than their parents," he said. As a result, college campuses have become hotbeds for environmental movements that have made a difference. For example, Radford said, 11 college campuses spurred by a Greenpeace campaign cancelled contracts with Apple until it made its electronics nontoxic. "Now they have some of the greenest products in the industry," he said. Radford said citizens should lobby corporations as well as government officials for change. "Governments and corporations are the ones with the power to make really big change, but you and I are the ones with the power to get them to do that," he said. But where there are politics, there are obstacles. "Government action really matters, but politicians only care about two things—where they are getting the money to get elected, and where they are getting the votes to get elected," he said. "They are so busy raising money from big companies." However, he said that slowly but surely, progress can be made on a community level to fight for a cleaner environment. Even Blaine County might be able to make changes despite its unique challenges. Blaine County's carbon footprint is disproportionately large, due in part to the number of temporary residents who visit the area, use resources and then are not counted as part of the permanent population. Radford said second-home owners could help reduce the area's carbon footprint by donating money to develop clean energy systems such as solar or wind power for churches and schools in the valley, organizations that might not otherwise have the money to invest. Despite continuing zoning concerns over solar power systems in the county and wind turbines, Radford said clean energy doesn't need to be viewed as something that will block the scenic views the area is known for. "A lot of people go to Idaho because they love the beauty of the state, and many of the people who come have a very environmental ethic," he said. "Having some wind turbines on the horizon might not be discouraging." Solar power systems have become much subtler, and Radford suggested the county could look into encouraging panels that look like roof shingles. Radford said clean energy is also good for the economic development the valley is so eager to promote. "If you install solar or wind, you have about three more jobs than with a gas plant," he said. "Imagine if you replaced all that gas with wind or some solar." Overall, he said, solutions to energy and environmental crises lie in innovation, creativity and the willingness to take risks—characteristics he said Greenpeace has in spades. "Sometimes, in the tradition of Gandhi and Martin Luther King Jr., we'll say something is so wrong that we'll take risks," he said. "We're willing to break a silly law to make the statement that there is a much bigger crime being committed. We'll do almost anything, so long as it's peaceful." Radford will give a speech titled "Our Renewable Energy Future: What the renewable energy future will look like and the potential for Idaho" on Sunday, May 29 as part of the Sun Valley Wellness Festival. See future editions of the Idaho Mountain Express for updates on this event.